University students like to eat! They want large quantities, high quality and a variety of menu items. 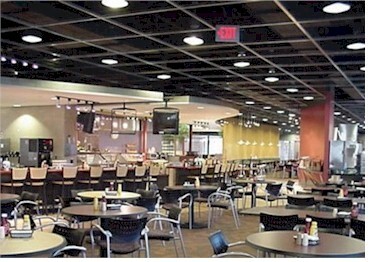 Meeting student dining needs within cost constraints requires sophisticated planning. In 1980, the University of Northern Iowa (UNI) in Cedar Falls, Iowa implemented its first computerized system for inventory management and meal planning. The system named FOCUS was intended to improve consistency between dining operations, provide standard recipes and provide cost information for decision making. Before that time, there were no standard recipes. Each individual cook used her/his own recipes. Consequently, students complained about the quality of products from one dining center to another. One facility had a great chili recipe because it had more meat in it, but another facility prepared chili with more beans. Using FOCUS daily menus were planned centrally from standard menus. Also, the amount of food that was prepared by each facility was determined centrally. FOCUS is no longer in use at the University of Northern Iowa. A newer system called FoodPro� was officially installed at the University of Northern Iowa in February 1999. Aurora Information Systems develops and markets FoodPro�. FoodPro� is an integrated software application with modules for all of the major tasks in the food service business including forecasting and precosting, menu planning, food purchasing, production and inventory control, catering, nutritive analysis, a point-of-sale interface, post cost reporting and financial analysis. The University of Northern Iowa is using the current FoodPro� Release 1.7. UNI has a Software Maintenance Agreement that provides telephone support, program fixes and continuing enhancement and improvement of FoodPro. Software enhancements are included as part of Aurora�s Maintenance Agreement at no additional cost. FoodPro is updated in an annual release that has been reviewed and approved by its user group. Most update releases include both new features and improved ways of performing current functions. Aurora provided UNI with a detailed implementation and training schedule that ran about 12 weeks. Aurora�s tasks included converting files to the new system, installing the database system and FoodPro software. Jerry Cully, President of Aurora, made 3 visits to UNI over the 12 weeks working through the installation and training process. UNI was responsible for installing hardware, printers, and Internet access. One difference between the former computerized system and FoodPro was that the input work was decentralized. Instead of sending the input information to a central office, computer workstations were needed and used at all dining locations. This allowed for more control at the unit level and faster, accurate and more flexible information was provided. Currently, there are about 50 UNI staff members who use FoodPro for some aspect of their job. A web-based Power Point presentation of screen shots from UNI's implementation of FoodPro is available by following the link --> click here. Who provides technical support for FoodPro at UNI? What support is provided? The university employs two part-time technology coordinators that support the computer systems used by the dining services which includes FoodPro. Most of the FoodPro functions are distributed and work is completed in-unit. There are some global functions provided centrally � calendar preparation, scheduling of weekly system processes, standardized reporting and some menu and recipe work. The Purchasing Coordinator centrally maintains global inventory vendor information. Two part-time staff provide a �back-up� in case someone is sick or otherwise unable to perform their job on a given day. The staff at Aurora Information Systems provides immediate assistance for occasional system questions or issues. Phone support is available 8:30 AM � 5 PM Eastern time, Monday - Friday. They also have the ability to access the system from their location to help solve problems. The consensus is that Aurora staff "do a great job of listening to our requests and ideas and integrate those ideas into later upgrades." UNI has purchased custom modification in a few situations where UNI had unique circumstances. Aurora also conducts a user conference each year to discuss what are needed improvements, as well as what they have coming out with the new upgrade. FoodPro at UNI is linked to a major supplier, Martin Bros. Distributing Co. (www.martinsnet.com). How does the computer link to Martin Brothers work? Orders are sent directly to Martin Brothers via the Internet. There is a script that runs on the FoodPro server that pulls a file for each location of items scheduled to be ordered that day. In the FoodPro system, order groups are developed that list items and their specified order, deliver and use dates. Managers have the opportunity to adjust orders until 1:00 pm on the order date. At this time the script runs, sending the list to Martin Brothers and not allowing any additional automated order changes. At 1:30 pm each day, a confirmation is emailed to managers and assistant managers listing account names and total number of cases ordered. This is used as a checkpoint that the orders were successfully received by Martin Bros. Distributing Co..
Aurora's FoodPro� is an integrated food production planning and control system that provides support and control from raw food purchase through production to financial analysis. It provides historical, as well as current and projected data, in terms of food usage, costs, operating margins, and service. FoodPro runs on a client supplied server of modest size. The server itself is usually managed by the university�s IT staff or even by the dining department itself. Jerry Cully, President of Aurora Information Systems, notes "we have tried to develop the product for the foodservice department and, although we take advantage of current technology, we present the technology mostly in a food manager�s vernacular." The FoodPro architecture is best described as client/server and it is designed as a total departmental solution. This means that the software is structured to parallel the sub-departments and functions within a typical foodservice, i.e., menu planning, production, purchasing, nutrition, accounting, etc. Further most of these functions can be organized by the customer either centrally or by unit. Aurora Information Systems partners with IBM Software. IBM�s UniVerse product is the database manager that stores, accesses and manipulates data according to instructions given from the FoodPro programs. IBM�s RedBack Interactive Web presentation software supports the real-time communication between individual department Web pages and the FoodPro UniVerse database. RedBack manages the user requests for and the transfer of data to the Web page. Aurora acts as the primary contractor in regard to these two products and coordinates the involvement of its University customers with IBM. Even though the customer contracts directly with IBM for their product support, Aurora generally provides the first line of support for these IBM products. FoodPro� is proprietary software bundled with the IBM products that offer platform independence across Windows�, UNIX� or Linux� servers. Fig. 1. FoodPro� opening screen. FoodPro� system functions range from forecasting to purchasing, menu planning and costing. Enhancement modules include warehouse and inventory control, purchase order management, a POS interface and sales reporting, nutritive analysis and a module called FoodPro On The Go! Using FoodPro the number of patrons expected at a meal or during a meal period can be forecasted based on a historical database. The historical forecast is refined by manual user adjustments and trend analysis. Operating reports are provided for individual food service locations and summarized to the departmental level. Operating reports summarize sales, product costs, and any other operating expenses. Special events can be planned and coordinated with the catered event function. The customer, date, menu, number of patrons, and price are entered into the system. The catered event function pre-costs the menu at the most recent or replacement purchase price, and then calculates and stores the amount of raw food required to produce the menu for the number of customers specified. Using FoodPro all recipes required to produce a week's menus can be scaled or batched to yield the exact number of portions required. All production requirements are summarized by the production department, and a requisition is printed detailing the amounts of raw food products to withdraw from storage areas. Recipes prepared internally by commissary operations and production departments and similar recipes from individual locations are combined and printed for the scheduled day and meal of production. The inventory control function calculates and prints the actual use of every inventory item, the deviation from planned use (or shrinkage), the physical ending inventory reported, and the dollar value of ending inventory. The purchasing function calculates amounts to order from each vendor based on exact menu needs, taking into account stock requirements, and individual vendor delivery schedules. The Menu Planning Module determines in advance the cost of serving any combination of menu offering and the resulting gross profit. All cost computations are made on the latest purchase price using any recipe specified. A menu modeling program allows food service managers to perform "What if?" analysis for future planning purposes. A menu item cost summary detailing product cost, gross margin, and gross margin variances also helps managers in menu analysis. According to Cully, "Although there are quite a number of competing vendors, The CBORD Group Inc. and Computrition Inc. are the two companies that most frequently go head-to-head with FoodPro. All three companies offer mature, robust products and many differences are in philosophy rather than function. A particularly important aspect of the FoodPro software is that it generates most of the information required and the person using it needs only to verify information � we call this entering-by-exception. For instance, when forecasting the expected patron counts and portion forecasts are generated based on past history and the manager makes changes only when necessary. Likewise, orders to outside vendors are automatically generated based on on-hand inventories, planned menus, open orders and vendors� delivery schedules. Transfers and invoices are not entered but are automatically generated and are changed by exception. This philosophy greatly reduces required data entry and increases accuracy." Cully feels "Aurora Information Systems has provided a level of customer support beyond what is normally experienced in the software industry. If fact many clients say that the service levels of Aurora Information Systems exceed those of any vendor in any industry that they deal with. This is due in part to segmentation where we cater to only a small number of exclusive clients and everyone in our firm understands the needs of each customer. While Aurora Information Systems is a small business, it is dedicated to providing the best in Food Service software. Aurora Information Systems assures each client that, in our case, our size adds to our strength. Aurora Information Systems has a most unusual relationship with our client base and our size insures that we offer the personal touch that is seldom present with large vendors." Aurora plans to release FoodPro� 1.8 at the annual Users Conference at the University of Arizona in July 2005. FoodPro 1.8 will include enhancements such as streamlining the bid analysis and ordering process, more new �smart� programs that assist in the analysis of data collected within FoodPro and a special emphasis on the catering business. In addition to major changes in the existing FoodPro Catering Module, which controls the �back office� functionality, Aurora is releasing a new Catering Scheduling, Reporting and Billing Interface that is designed more for the catering office rather than the kitchen. It is based on Microsoft�s Outlook� and Exchange� and includes scheduling of events, assigning tasks to complete and interdepartmental messaging. Also, as interdepartmental charges are normally processed as transfer journal vouchers on the university�s general ledger system there is a custom billing interference to the university systems included as part of the product. Another new product being released is called �FoodPro on the Go!�, which is an online ordering and information exchange component for take-away, Pizza type delivery, Grab �n Go or C-Store concepts. This provides the potential for higher sales revenues for the department and greater convenience for their customers. According to Cully, "future directions include more interfaces with supply chain vendors to streamline the just-in-time ordering and receiving processes. We are also adding a web-based catering ordering product that will allow university departments and individuals to interact with and order from the catering department online. It is anticipated that this will greatly reduce the labor necessary to accommodate this ever increasing segment of business while offering more flexibility to the food service customer." According to the Aurora Web site, "Effective planning and control will result in accurate and timely purchasing, the reduction of waste, a more productive operation, and better customer satisfaction through consistent quality and better service." Computer support for UNI Dining Services has become entrenched in how work is performed at UNI Dining Services and no one even speculates about doing without the planning, transaction processing, control and decision support provided by the FoodPro application. In many ways a technology partnership has developed between the University of Northern Iowa Dining Service and the software vendor, Aurora Information Systems. The University of Northern Iowa Dining services administrative offices are located in Redeker Center on the UNI campus in Cedar Falls, Iowa. Mona Milius is the Associate Director of Residence/Dining; Margaret Empie, is Assistant Director for Catering and Retail Services; and Carol Fletcher is Assistant Director for Residential Dining. UNI operates 13 facilities including Fresh Beginnings, Maucker Union Dining, Piazza Center, Rialto Dining Center, 23rd Street Market, and Biscotti's & More. Many of the baked goods served are prepared fresh daily in Fresh Beginnings, the UNI bakery. More than 750 students are employed by UNI Dining services in a variety of jobs in catering, retail, baking, office assistant, serving, driving, cleaning and student supervisor/manager. For more information visit www.uni.edu/dor/dining. The figure below highlights the UNI Dining facilities. Fig. 2. 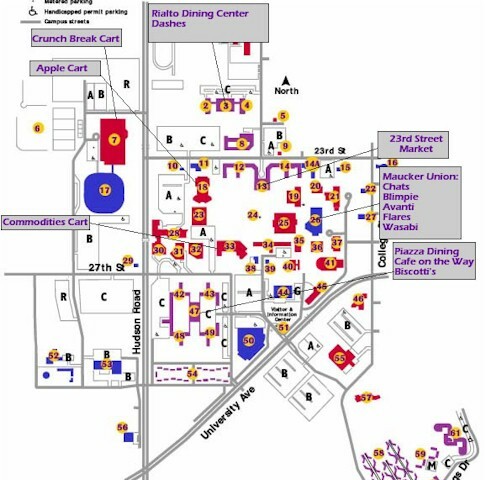 Map of the University of Northern Iowa campus with the dining facilities marked. Between August 2004 and December 2004, Rialto served 265,374 guests and Piazza served 263,019 guests. In the Maucker Union retail operations between August and December, Prexy�s served 65,978 guests and Chat�s served 44,024. The convenience stores served 102,250 guests between August and December, and cart operations served 12,727 guests. The budget for all operations is approximately $11,300,000. The University of Northern Iowa (UNI) is a state-supported University of approximately 13,000 students, located on the west side of the Cedar Falls/Waterloo metro area in northeast Iowa. UNI was founded in 1876 and the current President is Robert D. Koob. The University offers more than 120 undergraduate majors and the average age of undergraduates is 21.5 years. Overall, 92% of the student body is from Iowa. UNI was previously named the Iowa State Normal School (1876-1909); Iowa State Teachers College (1909-1961); and State College of Iowa (1961-1967). It was officially named the University of Northern Iowa in 1967. Colleges at the University include Business Administration, Education, Humanities and Fine Arts, Natural Sciences, Social and Behavioral Sciences and the Graduate College. Fall 2004 enrollment was 12,824, including 11,220 undergraduate students and 1,604 graduate students. Students come from 46 states, 73 countries and all 99 Iowa counties. The UNI website is www.uni.edu. Aurora Information Systems was formed in 1995 as a privately held corporation by the original developers of FoodPro�. The principals of Aurora Information Systems have been associated with FoodPro� for more than twenty-five years. They worked for the company, Concept Systems, Inc., which originally owned FoodPro�. Concept Systems was later purchased by another company, Uniquest, for whom the Aurora principals worked until December 1994. Jerry Cully, President of Aurora Information Systems, has 30 years of food service experience and has been directly involved with the automation of over 60 University Accounts. Mr. Cully participated in the installation of UNI�s first automated food system, FOCUS, in 1979-80. John Sooy, Vice President of Aurora, has been the chief developer of FoodPro� since its early days. FoodPro� was first installed at the University of Wisconsin � Stout in 1980. FoodPro� is now installed at 38 universities and 1 correctional facility throughout the United States. The Web URL is foodpro.com. Daniel J. Power is Professor of Information Systems at the University of Northern Iowa and he is the Editor of DSSResources.COM. Carol L. Fletcher is Assistant Director for Residential Dining at the University of Northern Iowa. What is the purpose of FoodPro? Do any FoodPro subsystems support decision making? Overall, is FoodPro a Data-driven Decision Support System or an integrated Information System? Why or why not? What decision support technologies were used? Why? What is the major benefit of using FoodPro rather than a tool like Excel for providing analytical information to decision makers? Why? Should all University Dining Services use this type of management planning and control capability? Why or why not? How does management know which Food Service software vendor to select? Do you think it is difficult to change Food Service software vendors? Why or why not? What are the key IS/T challenges in University food service? Today? Five years hence? What problems or difficulties do you anticipate with the use of this type of integrated decision support and transaction processing solution? Do you see any strategic issues or potential problems for UNI Dining Services resulting from its dependency on Aurora Information Systems? Power, D. J. and C. L. Fletcher, "University of Northern Iowa Dining Services uses FoodPro�", June 3, 2005 at URL DSSResources.COM. 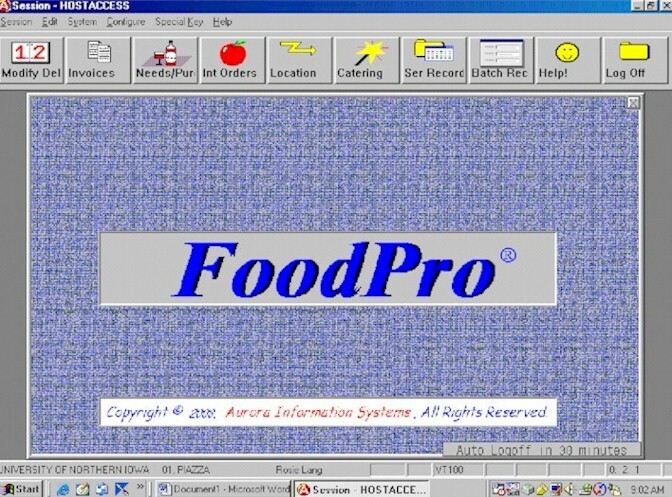 Jerry Cully, President of Aurora Information Systems, provided permission to use the screen shots from FoodPro� at DSSResources.COM on March 03, 2005. Contact him at email JerryCully@FoodPro.com. The authors want to thank Jerry Cully and the UNI Dining Services staff for help with this case. Dan Power especially wants to thank Rosie Lang for demonstrating the FoodPro� system for him. This case study was posted at DSSResources.COM on Friday, June 3, 2005. This case study is provided for informational purposes only. DSSResources.COM makes no warranties, express or implied, about this case summary. FoodPro� is a registered trademark of Aurora Information Systems.